Jonah and The Whale Seafood Buffet has a diverse selection of menu items available at great prices. Come Dine In An Authentic Whaling Tavern! Jonah and The Whale Seafood Buffet has been satisfying diner needs in the Ocean City, MD area since 1976. We have been operating under new ownership since 2008 and continue to prosper on all levels. Our eatery proudly offers a variety of all-you-can-eat buffets that satisfy many tastes and budgets. 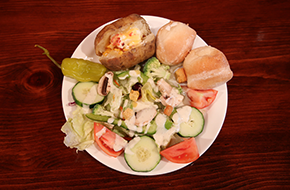 We are the family-owned business that offers the opportunity to Come Dine In An Authentic Whaling Tavern. 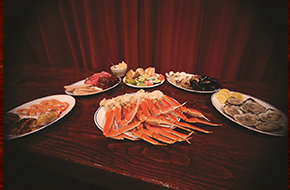 Our popular seafood restaurant features an all-you-can-eat seafood buffet that is stocked with many items including snow crab legs, fried shrimp, peel and eat shrimp, crab imperial, clams casino, mussels, and four types of grilled or baked fish determined by management rotations. Our specials vary according to the catch of the day or other seasonal options. Landlubbers, or those not desiring seafood, need not despair. We also have BBQ ribs, chicken tenders and French fries, fresh veggies, turkey with stuffing and mashed potatoes, plus macaroni and cheese available at all times. This huge assortment always satisfies needs for culinary diversity. Our customers love visiting our carving station to have roast beef and ham made to order. 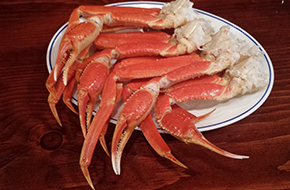 Our crab legs are our most popular menu item. All are freshly caught, cooked to perfection by our highly trained chefs, and served at just the correct temperature. Customers stand in line for our all-you-can-eat crab legs. The price is ideal, the serving portions controllable, and the taste simply unbeatable. We have serving and cracking utensils available to make the dining process as comfortable as possible. When in the Ocean City, MD area, enjoy a unique dining experience by visiting Jonah and The Whale Seafood Buffet. We are offering an early bird special 4 p.m.-4:30 p.m.: 3 dollars off adult buffet & kids 4 & under eat free. Come experience the wonders sooner than later!